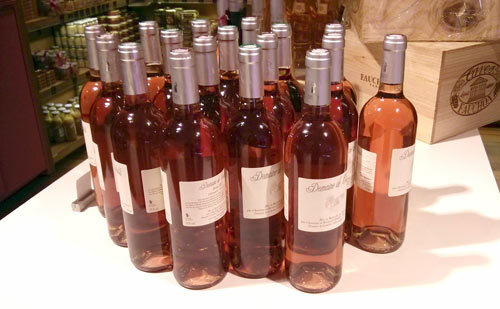 I was once told by an importer that in New York, rosé wine is a great wine to have in your catalog if you manage to sell out of all of it in the two weeks of Spring that comprise the “season” wherein people prefer to drink it. In Spain, it can generally be found throughout all of the Summer as it’s seen to be more full bodied than a white, but not as potent as a red. Also, it needs to be chilled, so it’s refreshing. 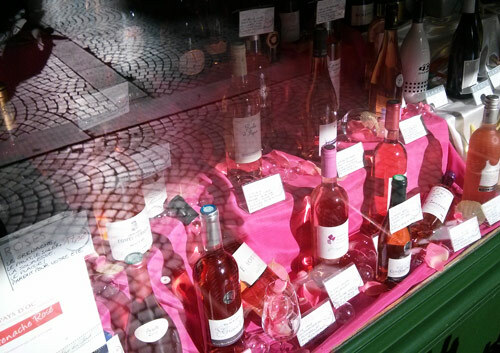 The Parisians take this to an exponential degree, though, and it seems that August is their month of choice to drink all the rosé to be found. Every store I went in to had massive displays such as the one above that occupied the whole entrance at the impressive store Lavinia on Boulevard de la Madeleine. The “going on vacation lunch” I accidentally stumbled upon at Le Cambodge restaurant had the servers pouring different rosés by the bucket load. Every table in every restaurant was graced with a pinky bottle and at the other end of the scale, the bums in the parks were also drinking rosé, I kid you not. I’ve never been a huge fan of this style of wine and am generally of the opinion it simply shouldn’t be made in Southern Europe as the climate is too hot and it comes out either in a sickly sweet fashion or like a red wine that feels as if it’s missing its soul. But the more northern styles you often encounter in Paris are something altogether different and have more body while still maintaining a light balance to them that allows for a very pleasing summer drinking. While I won’t say that I would choose them when presented with a wine list, while in Paris in August, I was happy to drink them. Always remember, only real men drink pink wine! I’ve told Bruno Trapan as much with his Che Non Che pink sparkling he’s been bandying about lately.